Does intensification increase traffic congestion? Earlier this week, I took a look at the relationship between congestion and density. I was investigating geographer Phil McDermott’s claim, based on some dodgy data comparing between cities, that increasing density would increase congestion. Economists know that it is difficult to make inferences about causality using cross-sectional analysis. Simply looking at variations between different cities doesn’t allow you to form robust conclusions about how those cities got to where they are. One of the ways in which economists seek to strengthen their understanding of causality is to look at changes over time. For example, if you observe that increases in density tend to be followed by increases in congestion, then that is stronger (although not necessarily conclusive) evidence that there is a causal relationship. 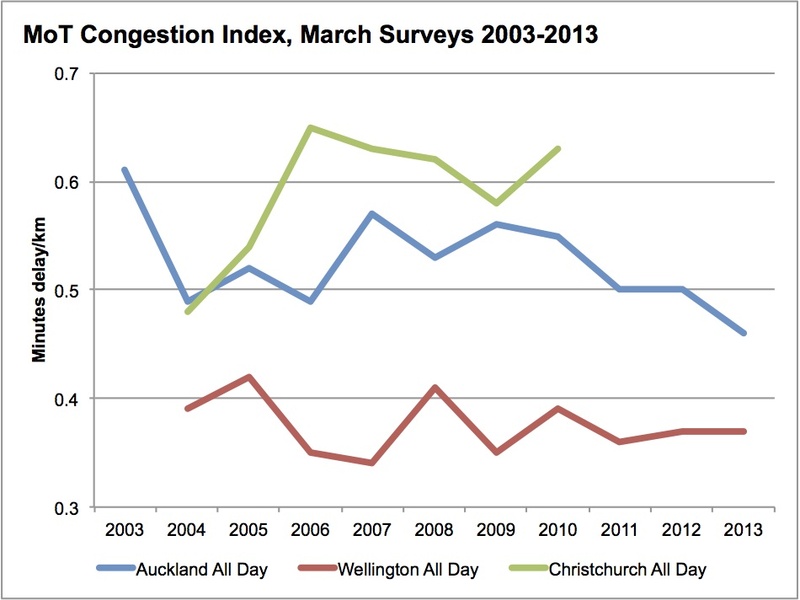 The Ministry of Transport’s Congestion Index, which estimates the average delay per vehicle-kilometre for five NZ cities over the 2003-2013 period. 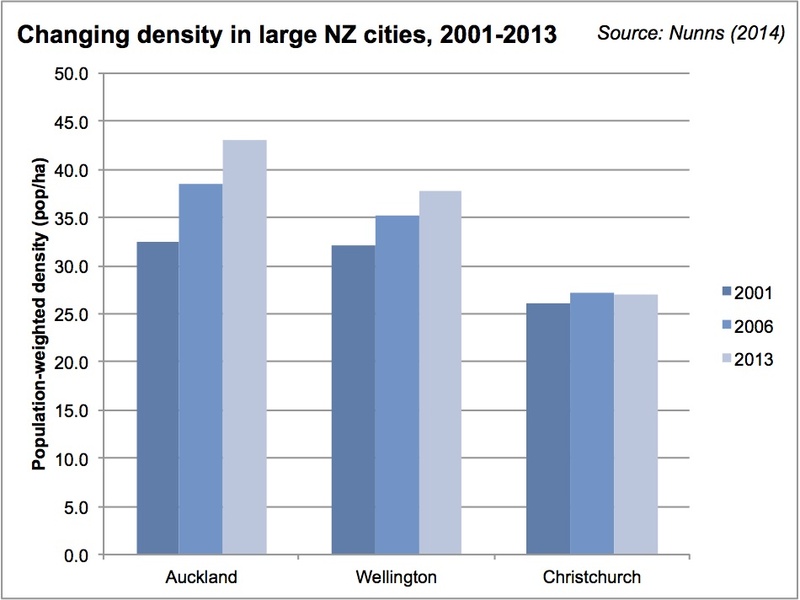 I’m going to focus on NZ’s three largest cities – Auckland, Wellington, and Christchurch – as two of the three experienced big increases in density between 2001 and 2013. (MoT hasn’t collected data on Hamilton and Tauranga for as many years.) If these increases in density coincided with rising congestion, it may be an indication that intensification can lead to increased congestion. And here’s the Ministry of Transport’s Congestion Index, which measures the average minutes of delay per vehicle-kilometre, relative to totally free-flowing conditions. This is a bit of an unrealistic comparison, as a 2013 NZTA research report by Wallis and Lupton shows. The only way that you can totally avoid all queuing or stopping at traffic lights is if there are no other cars on the road. So it wouldn’t be realistic to say that we could speed up the average Auckland trip by half a minute per kilometre. However, this is still a useful indicator for changes from year to year. Average delay for Christchurch drivers rose a staggering 31% between 2004 and 2010. Unfortunately, MoT’s monitoring seems to have been disrupted by the earthquake, but anecdotal evidence suggests that congestion has worsened since then. In short, data on changes in density and congestion in New Zealand cities contradicts the notion that intensification will necessarily cause worse traffic congestion. If anything, it suggests that rising density may do the opposite, by making it more feasible for people to walk, cycle, or take public transport. Do we need to treat this data with caution? Most certainly. As I noted earlier in the week, there are a number of omitted variables that influence congestion, such as such as changing consumer preferences, macroeconomic changes, and significant investments in both roads and public transport over the last decade. But it does suggest that wild claims about the negative traffic impacts of new apartment buildings should be taken with a significant grain of salt. Measuring congestion using an average has never made any sense as congestion occurs at the margin. We can all accept that additional housing causes additional person trips and it doesn’t really matter whether they are houses on top of other houses or beside other houses (density or sprawl). The point I think you want to make is that density allows walking cycling and PT trips to a higher level than sprawl and I think most people would agree. But my own view is that congestion is actually a necessary condition for a large increase in these modes. I think that because car transport seems to be a normal good but these other modes for most people are inferior goods (yes I accept some of you prefer them to driving but in the main they behave as inferior goods in an economic sense). This means that to get a significant shift we actually require congestion as a de-facto toll on road use. I have argued at hearings that intensification will add traffic to areas that are already busy and displace some of those existing car trips. I have also argued that we need to just accept that and not consider it an adverse effect. If you look at all the town centres and corridors that will be intensified they are almost all already heavily trafficked. I haven’t got far with this argument yet at hearings as too many people think we can have intensification and cars at level of service E. We can’t! the thing is that we cannot get rid of congestion, like you say. As long as there are roads, their capacity will be filled. What we can do is decrease capacity (instead of the trend to increase), forcing people to use other modes. What intensification allows us to do is reach many more people by investing in other modes, resulting in making walking, cycling and PT economically viable. Combining these two will result in a better working city… but we will never get rid of congestion. Christchurch is congested because of all the commuters from surrounding towns going into the city. Like Rolleston, Kaiapoi and West Melton. Also, the road works and lack of right turn signals make things worse. The severity of congestion in Christchurch, which remember is a small city, is a direct result of the dispersion caused by the annihilation of the Centre in the earthquakes. Everyone is driving across town in contrary directions at all times; when there is no proximity and near total auto-dependency fully cray congestion is the result. The Centre is simply a rat run between the various edge city encampments. If the Centre is only rebuilt in a bijoux way, which seems to be the plan, this inefficiency will be permanent and the the city will struggle to return even the pre-quake level of productivity. Shame. Christchurch is congested because it is the poor cousin in transport spending in comparison to Auckland and in particular Wellington. Greater Wellington and Greater Christchurch are of similar populations. Greater Christchurch is growing faster. Wellington has 150km of commuter rail and over 100km of motorways in existence or underway connecting Levin with the Airport. Christchurch has no commuter rail. Its bus service is in disarray, having no central terminal and bus routes being constantly changed due to repair of roads. The government has dodged out of assisting the repair of earthquake damage roads following the fixing of underlying horizontal infrastructure (water, sewage, storm water pipes). CCC lacks the funds to do this themselves so roads will take 20+ years to be repaired under the ‘normal’ maintenance schedule to a standard of smoothness the rest of the country take for granted. Christchurch has 20 to 30 km of motorway with some extensions planned but in no way will this be a comprehensive network like Wellingtons. I agree Wellington’s rail system measurable reduces congestion there. We know this from outages and from Ziebot’s theory. But Chch and Wellington are not quite as comparable as you imply because of such radically different geography and, especially now, settlement patterns. Welly has a very strong Centre, Chch has none, as I said above. More m’way won’t solve congestion in Chch, it’ll just cause a double down on driving as it does everywhere. The return of the bus system will help, as would a bold return to cycling. But increasing dispersal will always be a barrier to the power of agglomeration, as it is in Auckland and elsewhere. The problems of Christchurch transport system are highlighted by this story of a crash of the Waimakariri motorway bridge north of Christchurch. This bridge was designed for 3000 VKM an hour yet during the morning commute 3300 vehicles pass over the bridge an hour. So accidents and delays are not a surprise. Would Wellington or Auckland put up with this? Does the whole of NZ hear about Auckland’s crashes and delays but does that happen elsewhere? What is the solution? Sadly Ecan or NZTA CHCH, or the government, or who ever it was refused to revive passenger rail on the rail line that already exists on that route so I don’t see why it’s Auckland’s fault. Some very ordinary thinking is going on for poor Chch but don’t think it’s happening here. Some very cheap trains are currently available for tender here now that would be perfect….My view is that we should donate them to your city, but they’ve got to be wanted first. Patrick I am not blaming Auckland (or you, even though I happen to be replying under your post). It is the dynamic of how transport decisions are made in NZ that Auckland and Wellington issues get more coverage and go up in importance, while Christchurch ones tend not to. Canterbury was better off when it ran its on transport affairs. The Provincial railways a century ago would have been a faster morning commute to Christchurch from Rangiora and Kaiapoi than the current congested motorway. Cantabrians wanted a cycle friendly city in the ‘share an idea’ feedback post quakes. Brownlee, CERA, ECAN and NZTA all Wellington controlled bodies have completely undermined that local groundswell…..
Oh I agree, Christchurch needs to get its local power back and this has coincided with governance amalgamation in Auckland which has suddenly empowered the local here [in ways not anticipated by its authors] not seen here previously, well not in my life time anyway. But believe me central gov’s big paw prints are still all over this town too. The question every place needs to ask is how complicit are the local institutions….? Apply pressure. And that is a typical case of urban planning that does not allow for systemic housing affordability, and for people to be able to afford housing at less remote locations. This is the Achilles heel with compact city urban planning, and is the reason why so many compact cities still have long commute times. I am old enough and observant enough to have witnessed location choices change utterly for the worse in every city that gets a fetish for constraining urban fringe growth. I can also look at Real Estate sites for cities with different levels of systemic affordability. The typical comparison, is that an affordable city, always with a freely-growing fringe, does not just have brand new fringe McMansions for $180,000 – it has cottages and townhouses near the core for $100,000. Even poky apartments in intensification end up much lower value than what the centrally located cottages and townhouses USED to be. So the phenomenon of monster leapfrog commutes is in fact driven by this, and in general, as Bertaud has pointed out, even within the urban area itself, location decisions are being made on the basis of “what people can afford, period”, and any input effects towards efficient co-location decisions are swamped. The “transport cost savings” factor is utterly swamped by the added cost of “efficient location price premium”. I am participating in some very interesting academic discussion on this – “differential rent” itself appears to be exponentially increased so that there is no connection possibly to be made any longer with incomes, travel costs, amenity, agglomeration effects, and so on. These classic “Ricardian” differential rent effects seem to only be roughly quantifiable as actually correlating to land prices, in cities that are systemically affordable and free of speculation-driven price volatility. Tell us more, NZCID’s work has been looking quite promising to me for a while. Let me guess the construction industry thinks we should tax all and sundry to construct more heavy transport infrastructure, primarily motorways. Let me guess – the big boys in the construction industry want to be able to corner the market because all the smaller boys aren’t geared up to build tower blocks. It is notable that the construction industry in the UK has been decimated over 6 decades of strict urban growth containment, and their build rate now is only sustainable if dwellings are meant to last 1500 years. But the industry as such now consists of a few big players who have it to themselves. The construction sector, if it was properly organised politically, honest and intelligent and wanted to represent all its members, would want Houston conditions. It is always the one percenters and the big boys who want it some other way. Yes and containment is a bad policy. But until the NIMBYs and scaremongers allow equal latitude for density as well as sprawl then there is no free market and planning is necessary. Again you assume that everyone except you wants increased density and no sprawl. NO, lift all the restrictions and let the marvels of the free market decide. Just have standards to be adhered to not strict exclusionary zoning laws. Then we will see what people really want. Allowing sprawl but limiting density (which as far as I can see is what you want) just distorts the market. Goosoid, for the record; I believe that if the voters give government a mandate to save the planet with commuter rail systems, it needs to be accompanied by effective intensification; and that means compulsory acquisition of all the sites concerned within a specified distance of railway stations, especially in the CBD itself; and redevelopment of those sites to the desired intensfication and the letting out of the floor space at rates that cover the capital costs only. The status quo, socialising the infrastructure costs and letting private sector site owners capture monopolistically-derived minimum site rents, is deeply immoral and prevents any actual saving of the planet by pricing out many potential renters and buyers. I have also said before that any local election that returns a pro-compact city mayor and administration, should trigger central-government-enacted legal suspensions of all NIMBY rights within that city, and height restrictions, until that city has a house price median multiple of 3. The problem with the status quo is that everybody expects “somebody else” to have the intensification in their backyards, and “somebody else” to re-order their lives around catching trains. They elect a mayor and council whose platform is to save the planet, and then use every legal means to block the actual enactment of a compact city. The other point I repeatedly make is that there are unintended consequences to very crude, “corset round a city” regulations on growth, and that there are ways to achieve the actual functional efficiencies we need to achieve, that do no overall harm and actually work. Targeted land taxes; proper pricing of infrastructure; compulsory acquisitions of property; the “losers” under these policy approaches are the people whose interests do NOT coincide with the common good, and who stand to make zero-sum gains to no useful ends under the status quo. Where I have defended democratically enabled preservation of local neighbourhood character, is where this is not universal, and there is a full range of housing and location options that enable people to make choices that are properly priced. Every median-multiple-3 city actually does not lack smaller housing choices, and these happen to be really, really cheap. Even cheaper than the McMansions on 1/4 acre sections, which are cheap enough. By the way we do not have the perverse incentives there are in the USA for ridiculously large section mandates, and Kiwis will probably sort into an average section size of well under 1/4 acre – we never had much of this anyway even when the cost of having it did not break the bank. they seemed to imply over the next 30 years (under the PAUPs zoning provisions) there will be no increased use of PT and all growth in travel will be from private vehicles. although I also noted they said much greater intensification needed to be provided around the rail corridor. higher densities will increase congestion and that is a GOOD thing- because it means public transport is then viable!! For what it’s worth, I’d also expect cities with greater population to be more congested, regardless of how that population is distributed. That seems to be one potential interpretation of the data presented in the other post I linked to. That is interesting, Peter, if the travel survey was done properly. For example, if it surveyed Auckland residents rather than workers, it would miss the ultra long commuters from outside Auckland. But if the survey is correct, Auckland must be similar to Los Angeles, then. Slow moving traffic due to congestion, but short commute times due to dispersion of employment. Mass public transport is actually not compatible with a city like this and is a heinous waste of public money. Los Angeles has spent something like 70% roads, 30% PT for 4 decades, and PT still only provides 4% of total travel. Your observation is correct. There is a problem, though. The public transport does not “become viable” until the urban densities are at Tokyo and Kong Kong levels. Even in Manhattan, the subsidy cost per person km of travel is 10 cents plus. Even in much of Europe it is 20 cents plus, and rising to quite a lot higher than that in some services. Here we can not expect it to fall much below 40 cents. Increased patronage generally requires investments in added rolling stock etc that tend to reduce utilisation rates if anything. But motorists pay their own equivalent costs; the subsidy of road travel is down around one cent per person km of travel in the long term. Hence mode shift is a fiscal disaster and ratepayers/taxpayers will revolt at some stage – and we will NEVER get anywhere NEAR a point where we have actually made any savings in anything! The cost of congestion and the other diseconomies to productivity and agglomeration (including “pricing out” effects) make the whole exercise worse than fruitless. Look at the UK – and we don’t have London to prop up our economy. The likely outcome of pursuing the same policy course here in NZ, would be to turn Auckland, ChCh and Wellington into Liverpool, Newcastle and Sunderland. The social injustice in housing is the worst aspect of the lot and should make us re-think everything. Included in my proposals in the past, has been compulsory acquisitions of all sites related to “transit oriented development” – which is the norm in Hong Kong, Tokyo, Singapore, etc – how do you think they managed to avoid the “planning gain” effect otherwise? If you are not prepared to do this, you are just a sucker for the “big property” one-percenters. Ziebots is right on the face of it, but what he does not mention is the public cost of the alternatives. It is a fiscal impossibility to sustain much shift to modes that cost 20, 30 or 40 cents per person km of travel on them, in actual public money, compared to the public-money cost of travel on roads which falls over time, converging on 1 cent per person km. This is why cities can spend a split of 70% roads, 30% PT, and end up with 96% road travel, 4% PT after 40 years. How much cost is acceptable, to make the PT so effective that people will use it instead of their cars? OK, you can take Wendell Cox with a pinch of salt, but I don’t know anyone else who has tried to calculate the cost of substituting PT travel for car travel, and Cox estimated the cost to be between 70% and 140% of total GDP. How wrong can he be? Is 20% of GDP an acceptable cost? One problem is that the intensifications that are intended to render the PT “sustainable” by delivering ridership that boosts utilisation of the vehicles, never happen. I have explained many times why they don’t happen. The target “system shift” that advocates like you are chasing, lies at Hong Kong and Tokyo and Singapore density levels, and note that in none of these markets is private site owner rent-capture allowed to hinder the success of the whole system! We are centuries short of attaining MASS transit sustainability, and won’t EVER make it without suspending property rights along the lines that occurs not just in Asian nations, but in some European ones too. Our status quo is just TOO beautifully convenient for certain wealthy vested interests – whack the growth boundary in first, hike the land prices and site values, THEN start trying to upzone, THEN start paying land owners through the nose for land needed for the train set! I am restraining myself, this is a scandal and the pitchforks should be out over it. The idea here attributed to Ziebots above was popularised by Mogridge (Lewis Mogridge Position) and Anthony Downes. Wikipedia dates Lewis-Mogridge as 1990 but I know Mogridge was promoting the idea as early as the 1970’s: the basic concept being that the level of service on the road is determined by the level of service of public transport – it can also be seen as a generalisation of the idea of a Wardrop equilibrium used in traffic modelling by traffic engineers. I tried to promote the idea in New Zealand in the 1980’s (which is why I doubt Wikipedia’s date) but it does rely on public transport being a mode of choice rather than the mode of last resort. Thus in the 1980’s I believed in NZ it only applied to Wellington, not Auckland or Christchurch. Now I believe Auckland does have significant numbers of public transport ‘choice’ users and thus Lewis-Mogride (or Ziebots) should apply. In other words, to reduce travel time by road, you need to reduce travel time (including access time) of public transport. Downes promotes the view that congestion can only be cured by road pricing, a view with which I concur. Jonathan Bee says we have to have congestion to convince people to use public transport, but congestion charging is the better way to achieve this as demonstrated by Singapore. Congestion pricing would encourage higher densities in the city centre, encourage public transport, walking and cycling, and encourage more compact cities while at the same time prompting a city form that maximised the city’s function as an efficient labour market as promoted by Alain Bertaud. Thanks David. The clearest example of this phenomenon in Auckland is the Harbour Bridge and the Northern Busway, where we now have fewer vehicles crossing the bridge but more people than ever before. Here the ‘road price’, as it were, for travellers who choose to drive, is time; it’s quicker on the bus. I’m sure the same occurs on the southern motorway and rail, it’s just not as obvious as the route isn’t so explicit. Recently we have also seen many bus users from SE Auckland transfer to rail at Panmure since the service and station there improved, again saving time compared to staying on the bus and in traffic. Mogridge, Downes, or Zeibots; it works, and the cost incentive can be time or cash, or both. Thanks David and Patrick. Would anyone want to do a Lewis-Mogride or Ziebots analysis combined with Bertaud of New Zealand cities in particular Greater Christchurch? The first place I would look would be the mode choice parameters in the regional model. A quick look on the web suggests (but i can’t be certain) that the Christchurch Transport Model does not have a mode choice step at all, which means that the people who designed that do not think there is any trade-off between bus and car travel in Christchurch. Of course they may be wrong. Do you think many people coming in to Christchurch by bus from (say) Kaipoi or Pegasus have a car available for the journey? Of course even if there is little ‘choice’ bus travel now, it is quite possible that the equivalent of a northern busway linking Pegasus/Rangiora Woodend, Kaipoi to central Christchurch would be attractive to car users. Whether it would be worthwhile depends on the degree of congestion. What is the difference between the congested time and the uncongested time at the moment? David to answer your questions there is significant delays of 30% or more. I know people have taken stress leave in part because of the increase and uncertainty of there daily commute north of Christchurch. A work colleague who migrated from suburban New York used to brag about how easy it was to get around Christchurch now says that New York is quicker. Buses in Christchurch do not help because they do not have any dedicated ROW so they are always slower than cars. Obviously there is no passenger trains. Over the years buswatch has got increasingly desperate in his calls for a bus rapid transit service. The central problem with all this discussion about ChCh, is this. A linear-oriented city will never function as efficiently along the Bertaud lines as an amorphous growing grid city. ChCh needs to become an amorphous growing grid. NZ is hostage to a kind of super-linear thinking in urban form and connections – everywhere we seem to build north-south and nowhere else! The only point of linear transport planning for growth, is the making of mass transit mode share the end in itself. All thought of the city as a labour market or demand enabler, is lost. The supply of land potential is highly limited compared to the amorphous grid growth potential and the effect on land rent, and pricing people out, is magnified. The ultimate utopian amorphous grid city would have such minimal “pricing out” effects that everyone would live within 5 minutes of work, maybe even within walking distance. But people tend to bank the advantages of this kind of urban form, in things other than co-location efficiencies. Nevertheless, cities data sets always show outliers on the LONG side, are the cities where “pricing out” matters. Systemically affordable grid cities “price people IN” – they just don’t necessarily choose to continuously shorten their commutes as this possibility increases. William Wheaton’s 2002 “Commuting, Ricardian Rent and House Price Appreciation in Cities with Dispersed Employment and Mixed Land Use”, should have made him famous. But sadly we live in a world dominated by rent-seeking interests. Everyone would live 5 mins from work? So husband and wifes will generally work for the same employer, or will they live in seperate houses to be close to work? But does that mean I have to do that job for the erst of my life or do I have to rearrange my whole living situation if I move jobs. So I have to relocate my whole family to another area? What about if I work contracts and I have different jobs all over the city? What about if I live 5mins from my job but my wife works at another job on the other side of the city? The alternative is that I move jobs and now I am faced with a commute across the city with all the cost, stress and unpleasantness that brings. Plus the massive subsidy from the government to motorists when they build the roads to allow all that cross city traffic and supply all the parking involved. Of course this is actually what happens and why dispersed cities don’t actually work any better than monocentric cities but involve more driving. If only everyone lived within a certain distance of a concentrated area of employment. Then if I move jobs, chances are I won’t have to change my commute. Or if there were multiple concentrated areas of work joined together by some kind of reliable, frequent transport system with vehicles on their own right of way so not held up in traffic. I wonder if anyone else has thought of that? Phil said “NZ is hostage to a kind of super-linear thinking in urban form and connections” Except we are not really captive to it. The current planning system involves everyone banging on about compact cities, they design rules for that and then when that planning fails we extend the city as needed. A kind of say compact but build wide process. So true. It was really odd to hear Council defend the compact city theory in the Unitary plan hearings when the plan they have proposed is anything but compact. “and then when that planning fails” – It isn’t so much the planning fails as the self interested (especially older) residents reject the compact model because they believe all sorts of myths around what will happen if that model is adopted. Most just have a reflex, emotional reaction to any kind of change and assume all the worst case scenarios – even with lost of evidence to say otherwise. Or they do the classic NIMBY “oh yes great idea, but it can’t work in this suburb because we are special and have unique factors”. Basically the whole North Shore is “special”. Living there, I agree it is “special” but not in the way they mean. They then cling to models like Phil’s dispersed model. But they (and I think Phil) are still clinging to a “jobs for life”, single income earner, static model of employment. That is not the reality anymore. And yet we end up with a pretty good result. Some apartments in town for those who want a perch and some houses in the burbs for those who prefer a nest. The secret to happiness with this system is to not believe in any of the doctrine but lobby to get as many new houses in total built. Most people are not so stupid that they need the Council to control where they might live they are quite capable of choosing for themselves. The biggest impediment to apartments is not their size, location or even price. In my view it is 1/ you are buying in to a body corporate that can decide for you when to spend your money; 2/ accepting that the management company can take a big cut, (with houses you can manage repairs yourself); 3/ taking a bigger risk on weather tightness issues (it is easier to pick a good house than a good apartment); 4/ The good ones are often on leasehold land which no investor is going to touch. The utopian COMPACT city plan assumes that everyone lives and works at high density a short walk, cycle or transit trip apart. This never works out in reality and there are in fact such perverse unintended consequences that the net result is steeply negative. There are no gains in efficiency in commuting, no gains in productivity, no gains in local pollution, no gains in local public finances; and there is definitely a systemic scandalous change in economic land rent and housing costs. As I point out, all the commuting-data outliers on the high side are dense cities. There are no affordable low density cities as data outliers on the high side. There are no outliers on the low side, apart from some economic disaster cities where 20%+ of the people have no need to travel (no jobs). The reason that there are not a whole lot of cities with sub-20-minute average commutes, is not because this is not possible, but because people don’t let their whole lives be dominated by this single decision. We need to go by the outliers on the high side to see whose policy prescription is harmful in this respect. There is respected work by Marchetti and Zahavi on “travel time budgets” – though people don’t try to keep reducing their commutes further and further below 30 minutes, they DO try to NOT have commutes much OVER this. If they are doing seriously long commuting on average, like in Hong Kong, Tokyo and London, there is an element of LACK of choice. I don’t agree. It does work in cities I have lived in in Europe that are monocentric perhaps with some other employment centres. All joined by good quality separated PT. It doesn’t matter whether it is a “short” journey – it is a journey that is achievable and in a predictable time. You only look at English speaking countries (as overwhelmingly do your good friends at Demographia) and therefore conclude the model doesn’t work. I suspect because that suits the outcome you want to get to. If you judge those cities by the ability to get from outer suburbs to the centre by car, then no – congestion is a big problem. But if you judge it by the ability of most people to get where they want to get to by any means available, then they do work. What doesn’t work is scattering jobs all over the city and then decreeing that this will work if only everyone would restrict their job search to nearby jobs. This massively restricts the jobs an employee can apply for and the employees available to that business. It happens all the time when I am looking for a job in Auckland. Many areas are just impossible to apply for jobs in as the commute would by horrendous when they are in areas like Penrose, East Tamaki, Albany or Mt Wellington. So I just don’t apply as I would need to relocate to make that job worthwhile. That means there is less competition for that job and so people are paid less. Yes, exactly. Or at least that’s the world of choice that we should have, but we still suffer Council regulations from the sprawl era that inhibit other typologies, whatever the deranged suburbanist above imagines. Patrick, how can you accuse me of that, when I have protested the fact that centrally located cottages and townhouses that used to be $120,000 and still could be going by the evidence of cities that still have a median multiple of 3; end up $700,000+ as a city’s urban land market is distorted by a growth boundary? How can YOU claim to be on the side of “increased choice”? We actually do NOT have “no choices” for those who want CBD apartments, and centrally located townhouses; what we have, is a growing number of such actual housing options (you want more still and I am not opposing you on that) but the PRICE of them has been hiked obscenely! An urban growth boundary DOES THIS, every time. The evidence is undeniable. I have a strong grip of the theoretical failures that make most economists unhelpful on this reality (let alone urban planners with no capacity at ALL for economics) and believe I am helping to enlighten many of them (using the work of the specialists who DO understand this stuff and got it right years ago – like Alan W. Evans, Paul Cheshire, Natacha Aveline, Dimitris Emmanuel, David Levinson). The essential wrong assumption is that building “up” lowers floor rents. Yes, it does, when the urban land rent curve is anchored at the fringe, in freedom to redevelop rural land. Without that, upzoning increases site rents everywhere. This is why there are US cities with de facto growth boundaries and an average section size of 2/3 of an acre + and a median multiple of 6 – 9; and there are also UK cities with an average section size of 1/20 of an acre and 6 – 10 times the overall density, that ALSO have a median multiple of 6 – 9. The “economic rent” extractable “per household” is elastic to density! This is why ALL median multiple 3 cities are low density! The problem is that without artificially hiking land costs, it is actually a choice most people will make because it is cost-effective, to consume more space. But the historical evidence from most countries is that US-style super low density sprawl is the outcome of perverse incentives that do not exist elsewhere. It needs another essay to explain. But what we need, to bring about the efficiencies in the factors we want to affect, is provide the right fiscal incentives and stand back! A planned urban form is a Procrustean “solution”. One of my favourite quotes is Anthony Downs: if a picture on the living room wall looks to be wrongly positioned, move the picture not the wall! He is talking about road pricing or petrol taxes versus a UGB! Density would increase without hiking the price of land, but petrol consumption could be cut massively and immediately, possibly without even increasing density. Of course very high petrol taxes are a reason for making PT relatively attractive in Europe and elsewhere. And generally, Europe’s urban densities, I regard as “about right”. Alain Bertaud, looking at Auckland and Wellington, commented to his audiences while he was here: “your cities ARE EUROPEAN in density”, not American! Sure enough, Demographia’s density calculations as well as Bertaud’s own ones, show Auckland to be in the ballpark with Amsterdam, Hamburg, Brussels, Ekaterinburg; and denser than the Ruhr valley urban area and denser than Lyon and other comparable size French cities. Of course Paris is unique – how big is it and how old is it? Now Bertaud points out too, that Auckland’s density is badly distributed. This leads to my core point, that to try to retrospectively intensify where it would be efficient, you need to “price in” people and businesses to those locations, but contemporary urban planning approaches in Anglo countries end up “pricing out”. I do wish more people who care so much about the issues, would “get this” and refine their advocacy. It has been very encouraging to see concerned citizens like Brendon Harre and Donald Ellis “get it” – and most of the economists I am in touch with, do get it. it is more difficult for laymen, and seemingly impossible for anyone who has the kind of mind that has led them into a career in contemporary urban planning and associated advocacy circles. It was not always this way, there are very interesting stories about how intuitively correct about all this stuff, urban planners were several decades ago. In fact “Nothing Gained by Overcrowding” by the architect Raymond Unwin in 1904 – 110 years ago – ! – displays a grasp of urban economic complexities that leave most contemporary economists for dead. The trouble is that for decades these issues ceased to be a problem and everyone forgot about the underlying economic realities. Goosoid: Europe’s systems work after a fashion, but we need to take the following factors into account. Their population levels – cities with more people, period, tend to have more density in the centre and at other significant nodes. Their cities maturity – they have dense pre-automobile urban cores that, while they have significantly lost density, are still “dense enough”. They DO have excellent road and highway networks, and often are allowed to do much higher speeds on those than we are. They have very high petrol taxes. Advocacy for this is a lot more principled and intelligent than advocacy for growth boundaries and urban form mandates. They have a lot of unusual features in property rights, rent controls, subsidies, and planning powers, that in the right mix, helps to keep costs down rather than up, and “price in” people to the efficient locations. (Click on “Download report UK” for the English language edition). At some stage, fiscal realities are going to force Europe to re-evaluate what they are spending so much money on. To some extent these subsidies are a subsidy to tourism, as it keeps more tourists, especially business tourists who visit Trade Shows in their millions, from driving rental cars on the wrong side of the road. We don’t have these International Trade Shows, and we don’t have Neuschwanstein Castle or Fontainebleau. In “Cars and Demographics” (1992), Charles Lave points out that even between 1965 and 1987, the growth in the number of automobiles per capita was three times faster in Western Europe than in the United States, which was much closer to saturation already. Dargay, Gateley and Sommers (2010) confirm a predictable relationship between car ownership and incomes, rising towards saturation in all countries, as incomes rise. The SHAPE of the relationship is predictable; the saturation limit might differ slightly due to the differing fiscal policies and so on between countries. But the basic evolutionary force is everywhere; it is not a question of “subsidies”. Automobility does not need subsidies any more than refrigerators do, and “refrigerator dependence” (imagining a halcyon past where we all ate fresh food) is no less misguided an idea as “automobile dependence” (imagining a halcyon past where we all walked everywhere). I am the first to condemn rampant consumerism in automobility (V8’s SUV’s, etc) – it gives a highly valuable thing a wrongly bad name, kind of like foreign aid workers wearing Giorgio Amani and provoking a reaction that foreign aid is immoral. Randal O’Toole calls the automobile “The Greatest Invention” in a book of that name – and everyone should approach that book with respect for its scholarship and integrity and take in some of the things they might not have understood before.